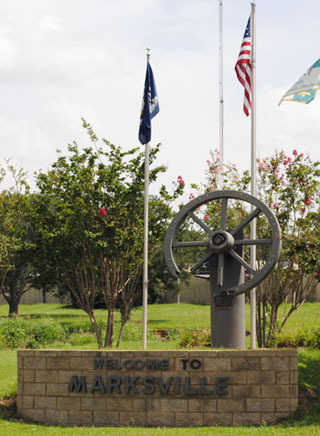 As Mayor, I would like to welcome you to the City of Marksville a friendly community located in Central Louisiana in the parish of Avoyelles. I am a life long resident of Marksville, attended Presentation Catholic School, graduated from Marksville High School and attended Louisiana State University. I served as board member for the Avoyelles Parish School Board for 27 years, including service as Chairman of the Executive Committee, the Finance Committee and the Building and Lands Committee. The School Board is the second largest business in Avoyelles Parish. I have learned first-hand how government works and how to serve the needs of the people. I have assembled a Citizen’s Advisory Committee to help me lead Marksville through the many challenges our City faces and to make sure we achieve our full potentials. I have organized our city projects with teams of employees to oversee the completion of maintenance jobs throughout the city. This ensures projects being finished in an organized and timely manner on a rotating and regular scheduled basis. Spring Bayou was once an area that could rightly be called a “Sportsman’s Paradise,” and I am working to restore it to its former glory. This could provide an economic boost to our City by bringing in wildlife enthusiasts from around the parish and beyond. I am the father of three children, married Nancy Baudin, and a business owner for 42 years. We are very proud of our friendly small town atmosphere and I invite you to browse through our website to familiarize yourself with our businesses, churches, historical sites, Tunica Biloxi Museum, Marksville State Historical Park, walking tracks, fine restaurants and for and added attraction the Paragon Casino Resort (gift shop, three cinemas, golf trail and much more). I invite you to take time to visit our city and experience our quality of life. It was Marc Eliche, so tradition has it, from whom Marksville got its name. Eliche, an Italian trader moving through the area in his wagon, was force to stop when one of his wagon wheels broke down. 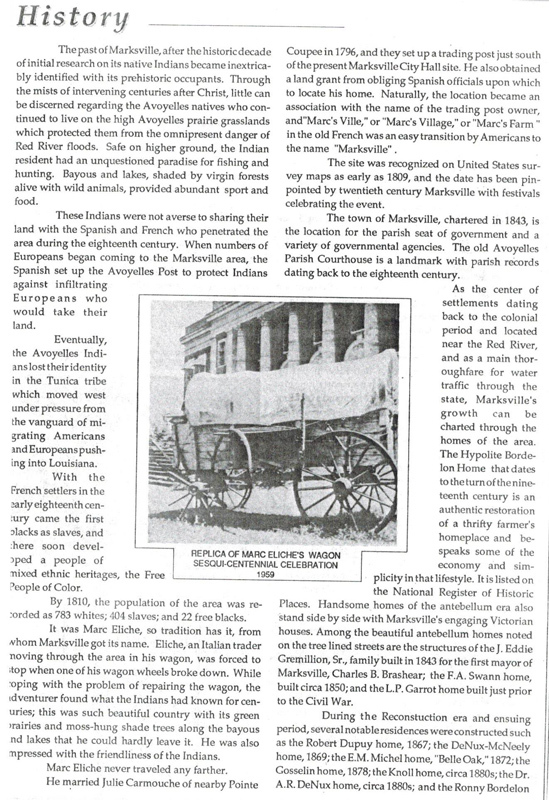 While coping with the problem of repairing the wagon, the adventurer found what the Indians had known for centuries; this was such beautiful country with its green prairies and moss-hung shade trees along the bayous and lakes that he could hardly leave it. He was also impressed with the friendliness of the Indians. Marc Eliche never traveled any farther. He married Julie Carmouche of nearby Pointe Coupee in 1796, and they set up a trading post just south of the present Marksville City Hall site. He also obtained a land grant from obliging Spanish officials upon which to locate his home. 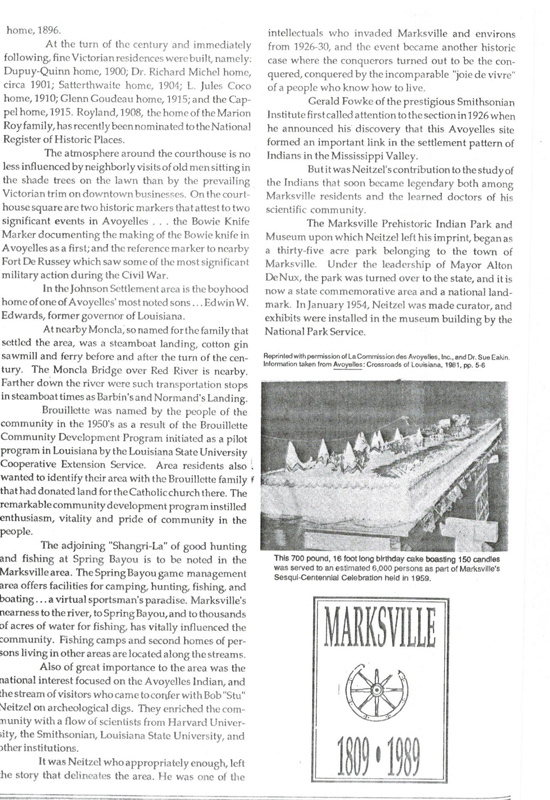 Naturally, the location became an association with the name of the trading post owner, and “Marc’s Ville,” or “Marc’s Village,” or “Marc’s Farm” in the old French was an easy transition by Americans to the name “Marksville”. The site was recognized on United States survey maps as early as 1809, and the date has been pinpointed by twentieth century Marksville with festivals celebrating the event. By 1810, the population of the area was recorded as 783 whites; 404 slaves; and 22 free blacks. The 2010 Census reports that Marksville has a population of 5,702. The old Avoyelles Parish Courthouse is a landmark with parish records dating back to the eighteenth century. The atmosphere around the courthouse is no less influenced by neighborly visits of old men sitting under the shade trees on the lawn and by the prevailing Victorian trim on downtown businesses. On the courthouse square are two historic markers that attest to two significant events in Avoyelles . . the Bowie Knife Marker documenting the making of the Bowie Knife in Avoyelles as the first; and the reference marker to nearby Fort De Russey which saw some of the most significant military action during the Civil War. Also of great importance to the area was the national interest focused on the Avoyelles Indian, and the stream of visitors who came to confer with Bob “Stu” Neitzel on archeological digs. It was Neitzel who appropriately enough left the story that delineates the area. Click on articles to view larger. Copyright © City of Marksville, 2019. All rights reserved.